Henry Ossawa Tanner (1856-1937) was a major African-American artist, and the first to gain international fame. Born in Pittsburgh, his father was a minister and political activist, and his mother, Sarah, was born into slavery, but escaped via the Underground Railroad. The family moved to Philadelphia when Henry was young, where his father befriended Frederick Douglass. In 1879, after teaching himself some art, Tanner became the only black student at the Pennsylvania Academy of Fine Arts. There he became a favorite student of Thomas Eakins, whose progressive approach to drawing and painting had a profound affect on Tanner. Although he began to have success and sell paintings, racism was a major roadblock for Tanner. In 1891 he went to Paris to study at the Académie Julian. He found that his race was much less at issue in France and chose to remain there for most of his life. He continued to have success and his 1896 painting Daniel in the Lions' Den (although that is a later version of the subject) was accepted into the Paris Salon. Tanner had a diverse body of work, including genre paintings, cityscapes, landscapes, Orientalist works, and interesting takes on religious scenes, such as the Annunciation and Sodom and Gomorrah. 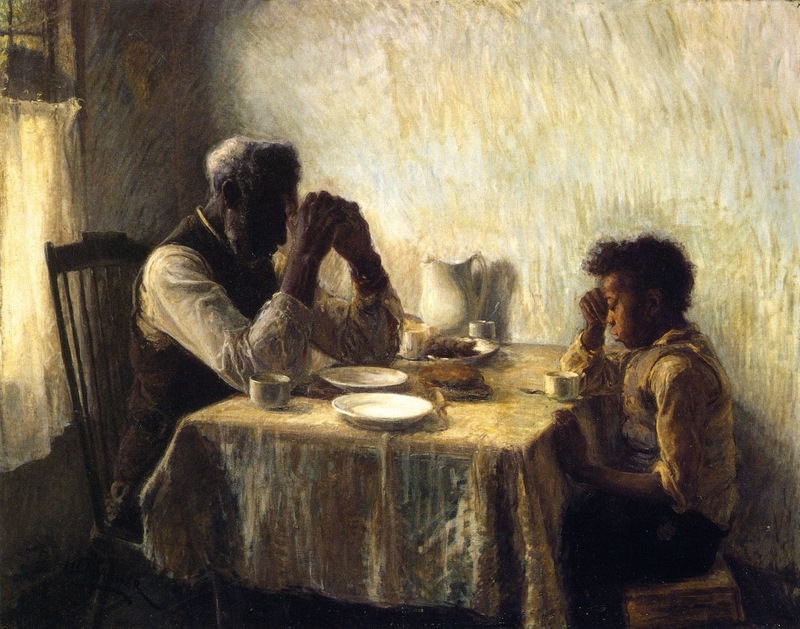 His two most famous paintings are, unsurprisingly, genre scenes of African American life—The Banjo Lesson (1893) and The Thankful Poor (1894), both painted during brief trips back to the United States. The Good Shepherd is another religious image, but to me the painting is much more about the setting and atmosphere than the ostensible subject. The lighting in this painting is quite effective, a pale blue glow that pervades the scene. The interaction of the moon and the trees is what gives the piece a lot of its tension; the moon is obscured by them but remains powerful enough to light the surrounding landscape. Meanwhile a small figure, presumably Christ but possibly a generic shepherd, stands or walks between the two trees, merely a feature of this mysterious and beautiful landscape.